After the riots in Noakhali, November 20, 1946. Mahatma Gandhi's mobile hut during his visit of Noakhali, 1946/47. It was designed by Satish Das Gupta and carried by a bullock cart between destinations. A mobile shed in Noakhali, 1946. 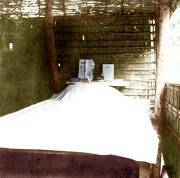 Mahatma Gandhi's bed in his mobile hut during his visit of the riot effected area of Noakhali (East Bengal), November 1946. 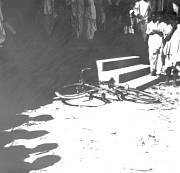 A damaged bicycle, Noakhali, 1946. Destruction caused by riots between Hindus and Muslims in Noakhali (East Bengal), November 1946. Right: Amrutlal Chatterjee. A group of people in front of a hut at Paniala village after riots between Hindus and Muslims in Noakhali (East Bengal), November 1946.